You’re probably curious about the title of this blog post. You might be thinking, “What? Of course, Jesus is not a demon!” Let us explain why we have opened with such a jarring exclamation. Just a few months ago in the state of Gujarat in North India, a new school curriculum was released. Within this curriculum this exact alarming statement - Jesus is a demon – was incorporated, and it was required by law that this sacrilegious statement (among others) be taught in high schools across the state. As Christians, we absolutely cannot submit to this. We know that the enemy is out to spread his lies and is intent on stealing opportunities for young people to know the one true Christ. It is, for this reason, we must continue to stand boldly with frontline leaders for the advance of the gospel in North India and beyond, and combat this statement with our anthem and creed that Jesus is Lord of all!! In December, Global Advance took the opportunity to do just that by sending a team of nationals to train and encourage frontline men and women in this region. To the glory of God, 250 pastors and 1,200 women were empowered to fulfill the Great Commission during our multi-initiative events. Gujarat is famous for plagues, floods, earthquakes, violence, communal riots, and persecution, but we pray for the day when Gujarat will be known for the next great REVIVAL. As witnessed through our recent training initiatives, the move of God is already evident in this place. 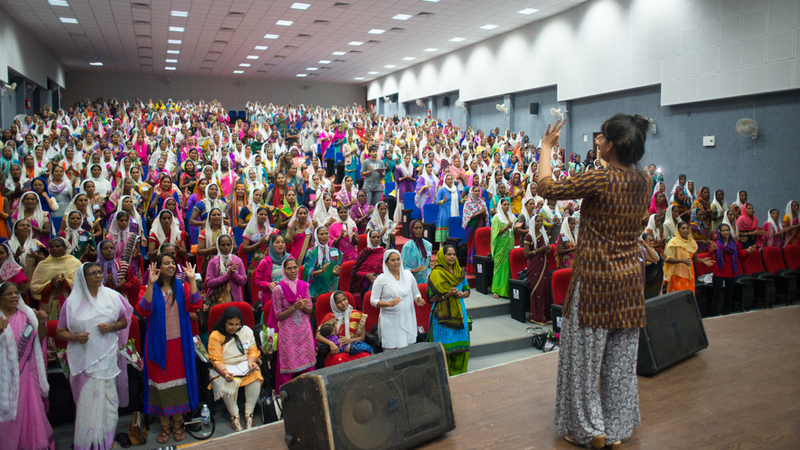 The December Esther Initiative conference was the largest women’s gathering of this kind in the history of this region. 95% of attendees were the next generation of rising leaders – now equipped, encouraged, and empowered to GO and reach the unreached with the love and hope of Jesus Christ. A team of 82 leaders has formed post-conference to meet weekly for prayer, with the goal of reaching many more from the community with the truth of Jesus Christ. In 2018, these leaders are praying to plant 12 new churches in strategic locations in North India. Still, opposition remains. Seven pastors who were on their way to the conference were discovered and jailed for three weeks. Despite the rise of persecution and increasing governmental restrictions, believers are standing firm on the Word of God and the encouragement and support from fellow believers like each one of you. Situations like these remind us that we live in a hurting world that is lost in the evil effects of sin. But God is on a mission to redeem lost and hurting people. In fact, the Bible tells us that one day redeemed people from every tribe, tongue, and nation on earth will worship Him. While we wait for this day, we believe the job of every follower of Jesus is to join in His mission to reach the world with His love and message of redemption. God is raising up mighty warriors among indigenous believers to fight for Christ’s kingdom by praying, preaching the Word, making disciples, and planting churches in North India. We are so grateful for your continued prayers and partnership that make this courageous work possible. Newer PostTHE GOSPEL IS ALIVE IN RUSSIA!